Yesterday, September 11, 2018, between 18:30 and 19:00, 15-20 men arrived outside 34 North Frederick Street in a van with no registration plate at its front and a UK registration number at its rear. They proceeded to enter the building using electric saws and power tools. Immediately after the arrival of these private security workers, 3 members of An Garda Siochana attended at the scene. 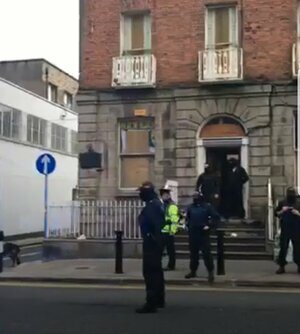 As community response to the eviction attempt began to build, they were joined by 1 Garda Riot Squad, 1 Public Order Unit, 1 Garda Transit Connect van an 1 Garda Jeep with dogs. 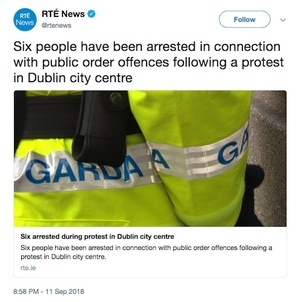 As peaceful opposition to the eviction continued, physical force was used against a number of attendees, while 5 activists were arrested and brought to various Garda stations throughout the North Inner City of Dublin. It is important to highlight that, as the security firm sent to enter the building contravened the above legislation, An Garda Siochana therefore defended an illegal activity and arrested activists who opposed this illegal activity. A large mobilisation of activists and members of the community gathered outside Store Street Garda Station in the aftermath of the arrests, demanding their release. Several of those arrested subsequently presented to hospital for treatment on injuries sustained before and during their arrests. The extent of injuries sustained at the hands of both the private security firm and the Guards includes: assault leading to severe wounds, shoulder injury and concussion as a result of being kicked in the head. The injuries sustained were so serious in nature they necessitated hospital care. Take Back the City condemns the actions of the security firm who illegally carried out forceful evictions on occupants at 34 North Frederick Street, a building which had been left idle for more than 3 years by its owners, the McGreal family. Moreso, we utterly condemn the actions of An Garda Siochana, who facilitated these illegal activities, arrested activists fighting against the ongoing and unprecedented homelessness crisis in Ireland, and used physical force in the process. We ask An Garda Siochana, and the State at large, how they can justify these actions? We ask them where this scale of physical support is implemented when ordinary tenants are being illegally and unjustly evicted from their homes? A solidarity rally will take place later today – further details to follow. The ‘Take Back the City – Dublin’ Facebook page will have more information on same during the day. Last night: What’s Going On Here? Posted in Misc and tagged statement, Take Back The City at 9:58 am on September 12, 2018 by Bodger. Was it chilly in Dublin yesterday ? Not as chilly as BoJo’s gaff.. They are concealing there identity because groups like this exist and contain dangerous people. 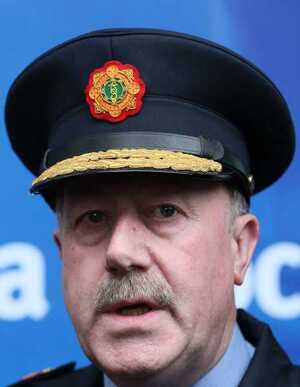 The gardaí have the power to arrest “dangerous people” should they break the law. That’s reassuring when they have a brick thrown in their front window and kids screaming. I’d love to see some proof of this. Which is what they did last night? But did they need to be masked to do so? 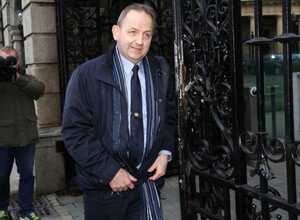 The publish Gardai names and addresses online so that they can be targeted for harrassment, so, yeah, it is necessary. Gardaí arrest scumbags without hiding their identity every day. Why was this different? No evidence they are dangerous. Tom taking the state’s side as per usual.. Try to justify the kick to the head. Illegla trespassers got evicted, good! He’s the grammar police. You can tell because he’s wearing a balaclava. odd – he has DEGREES you know! You forgot a full stop. Like I said sort out your grammar you amateur. Like I said, sort out your grammar you amateur. The Guard on the right on the second photo existentially questioning the life choices that brought him to this. Even aside from the actions of the Gardai, even aside from unsustainable house price increases, even aside from the homeless crisis, should people be allowed let grand old buildings in the centre of our capital city fall into disrepair just because they own them? Could ask Patricia Ni Greil that. Or Patricia McGreal. How about the Boy Wonder Murphy publishing data on what’s on the derelict and vacant site registers in each Local Authority? How long they’ve been there? Actions taken to remediate? Enforcement notices issued? Revenues raised by levies, CPO’s, dispersal etc? All the county councils publish the vacant and derelict sites already. Why would you demand Murphy publish information that is already freely available? I’m aware that the Derelict sites register exist. That wasn’t my point. What would be interesting is a nationwide picture of the situation. I haven’t seen that collated but perhaps you have? In any event there is little available information on the specific issues that I mentioned in my post. If you believe there to be, feel free to throw up a link. It’s worth mentioning that the vacant site levy is newly introduced and only takes effect from January 1st next based on what was on the register at the beginning of June 2018. Certainly I think it would be interesting to see what’s on the register now and what revenues will be collected next January. I certainly doubt that any of the registers capture the reality on the ground. Again if you have a spreadsheet with the data, please link it. Murphy’s way out of his depth but he has raised a very valid concern about how some of the local authorities have done little on the housing issue despite being mandated and resourced to do so. Data is generally available, but if not, mail the council in question. I suppose it’s different because those people weren’t using threats or force. Blueshoight fraperoom lickspittles don’t do “proof”. Funny how you more outraged by hypothetical violence that never happened, rather than the actual violence that happened last night by a bunch of thugs in balaclava’s and no ID’s or even licence plates on there van. Seem like you’re a bit slow today. That was for a promotional photo. Not the same as the Police wearing masks while they put people in the hospital. What exactly was cowardly about them? They put themselves at risk by trying to take a stand on an issue they believe is important. If you conceal your identity, illegally occupy building and intimidate the police and their families, then yes, the actions are justified. The calming voice of the DUP. And who intimidated the “police”? Again any proof of this? Why weren’t this rabble brought in to remove the o Donnell family from Gorse Hill? Seems like a sure-fire way of escalating the issue – both at the time and in terms of media focus. The force used seemed a bit much, but I’m finding it hard to be totally on the side of the protesters who have illegally helped themselves to private property and then cry outrage at the illegal activity of others. While I agree vacant property is a terrible waste, I don’t believe I have the right to occupy someone else’s property simply because I object to how it is used. I lived in the UK a few years ago and there was article in the news at the time about Charlie Simpson from Busted (I know, *eyeroll*). To paraphrase: He said his rebellious days of being a socialist are over now that he has been successful and has something to protect – he became Conservative as a result. I am no fan of the Conservatives – either at home or abroad, but having spent years doing a job I hate to pay for the things in life I need and want, you better believe I wouldn’t take too kindly to someone entering my property to tell me how disappointed they are with how I choose to use it. Perhaps in 40 years time, many of those protesting will have built up a life-time of stuff from a lifetime of work and plan to give it to their loved ones. Their views on whether private property is fair game may become a bit more nuanced. If one of these protesters is discharged from hospital and gets home to find it burgled, who will he call to enforce the rule of law? I don’t disagree idle property is a total waste – and should be legally taxed if that’s what elected representatives legislate for. It’s not fair-game for the outraged pedestrian though. With respect Mike, if you own a property and for whatever reason you are letting it rot in the middle of a housing emergency then the use it or lose it rule should apply. As per my previous posts, right to private property is not absolute because if that property became a safety issue you would be forced to comply. These people are not squatters, they are activists occupying long term vacant buildings with the intention of forcing councils and government to do their bloody job. I personally think it is admirable and hope this movement continue to grow. I have to laugh at people complaining about the Guards and the private security firm being illegal, when they are illegally occupying private property. Self righteous idiots. What’s that saying about two wrongs? If the protesters believe they have a legitimate grievance then they should send all their footage and statements to GSOC. If the protesters believe they have a legitimate grievance then they should sendpost all their footage and statements to GSOC social media. Not a word about this on the Dinnydo website. Normal service has been resumed. The regulations requiring persons providing a security service to wear identity badges in the course of their duties do not apply where such service is being provided for the protection of property, or in close proximity to premises in relation to which the service is being provided, so long as it is not a licensed premises. what’s the rationale for that, old boy? Aww. You love The Old Boy. My understanding is that the requirement was primarily aimed at doormen in pubs and clubs. More broadly, it applies where a security guard will be dealing with members of the public in the course of his work. Where a security guard is assigned to protect private premises, the rationale is that he will not be dealing with any member of the public and so it was not felt necessary that they should have to be readily identifiable to as a matter of law. No. The owners of the property are not “lawful occupant[s] in a dwelling” in this case. As a disused building it is not a dwelling – the definition of that phrase has been well hashed out by the courts over the years – and they are not in occupation. Shouldn’t you be masturbating to YouTube? If one can’t back up ones statements, that tells its own story. Similarly if someone has to keep changing their usernames, that also tells its own story. Cowardly comes to mind. Why don’t you reply to old boys point below? That’s section 2 of Schedule 1 to the Private Security (Identity Badge) Regulations 2009, which was linked in the statement posted above. Obviously these men were apprentices and weren’t then legally required to show ID. while carrying out the duties of his or her office or employment or to a person employed as a resident caretaker who keeps property under surveillance only as an incidental part of the duties of his or her employment. (2) The Authority may by order exempt from any or all of the provisions of this Act persons providing security services or security services of a particular class at a specified place, event or function or specified class of place, event or function or in connection with a visit to the State by a specified person where in its opinion, by reason of the size of the expected attendance or other exceptional circumstances, it would not otherwise be reasonably practicable to provide the requisite level of security services there. 1. Persons holding a door supervisor (licensed premises) category of licence who are providing a security service as a door supervisor in relation to licensed premises. It has nothing to do with the list of general exemptions to the 2004 Act. When I get into dutch, I soooo want OB as my lawyer. The fact that the vast majority of clowns on this site see nothing wrong with balaclava clad Gardai turning up to a peaceful protest tells us exactly how far backwards we have gone as a country. All of you clowns who benefited from a free third level education in this country should be reported to some oversight body for being a massive waste of taxpayers money. this ‘oversight body’ i take it will be a proper quango, with outrageously paid chief executives? The filth were illegally occupying property that wasn’t theirs. The filth had been asked to leave. The filth were then told to leave. The filth refused, and are totally responsible for this reaction. So explain why they weren’t brought in to remove the O Donnell kids from Gorse Hill Cian? “the filth”? … you’re an absolute loser, Cian. You really are a pathetic boot licker. If you read any of Ron’s posts he has a tendency of calling everyone/thing he disagrees with as ‘filth’. I was channelling that. But it was tasteless. My unreserved apologies to the occupiers. I don’t think they are filth, and I shouldn’t have used that term. That said, take out “filth” from the comment, and your point still stands. I thought it seemed a bit out of character, alright – fair dues. But you wrote four sentences, each of which began with the words ‘the filth’. So you are a typical FG liar. You were called out. You are as bad as Harris and Co. In fairness to Cian, you do use the word “filth” in EVERY post, Ron, it’s pretty clear that’s what he was referencing, but then, my tinfoil hat isn’t falling down over my eyes. Every once in a while people like Cian let the mask slip and they show how they truly feel. Like the Fine Gael lackeys he supports they actually see the marginalised and less well off in this country as being filth that should be discarded. Sure he stated it himself. And as for me calling politicians ‘filth’ on this site that’s an informed opinion based on fact and the past behaviour. Politicians are filth in this country. turn it off ron, you’re not kidding anyone. Fair play for what brother? For admitting what had been obvious for some time? That he is a toerag, bootlicker and ultra conservative prize pric? Freedom, tone it down a notch, sunshine, you’re getting pretty hyper with the insults. Aw, thanks, I’m more worried you’ll give yourself an aneurism with all the hatred and the pain and the rage. It’s a chat forum. Chat. The correct spelling of that word is “aneurysm”. See how easy that was? And you even helped me with spelling, double nice. Was a peaceful protest, Mr. FG Fanboy. Also, none of your points contradict the categorisation of this as a peaceful protest. true. It was (by all accounts) a peaceful protest. It was, however, an illegal protest. This is all very clever – but they misquote the legislation. The words they are using (in quotes) is NOT in the legislation. The legislation in question is relevant to doormen/bouncers. Sorry pal, all security personnel are legally required to display a PSA licence at all times and can be fined up to 3k for not having one displayed whilst on duty. This includes doormen and bouncers but covers all security officers/guards in any setting. You seem surprised that the Garda are selective in their application of law. This is common sense. If there is more than one crime happening they can only deal with one at a time – so the more serious crime should be addresses. A lack of front licence plate was not the most serious crime (and it is possible that a fine has been issued). Perhaps, but the optics aren’t good that the Gardai are backing up the lads who used this particular van. I mean, if the Gardai are on their way to reports of a shooting, they might ignore a cyclist running a red light and we’d all understand that. Why is it different? Because optics? The van has no front plate. This warrants a fine. Perhaps a fine has been issued. The Garda Bank marches in the St Patricks parade each year. The floats in the parade are driving on public roads breaking lots of laws. For example many don’t have a visible licence plate. Should the Garda band impound all the floats? Youre some full of bull. You’re squirming and turning the same as you were when Harris was being called out. Typical FG methodology. Put as many diversions into the conversation as possible. So, a van load of thugs show up in an unmarked van, proceed to assault citizens, and all you can come up with is a St. Patrick’s Day parade? I’m looking (and having difficulty locating, admittedly) a report that had said the van was also untaxed and uninsured, and that would make it completely untraceable. I’m not one for advocating the rights of people to ordinarily take the law into their own hands but regardless of that, the State and its agents have to be held to a higher standard so optics *do* matter, and responses have to be proportionate. I’ll concede on the van thing until/unless i track down the tax/insurance thing. My understanding is that it has a licence plate on the back, and it was a UK plate. So it is not untraceable. As for your point that responses have to be proportionate. I agree. An my opinion is that it would not be proportionate for the Gardaí to have prevented the eviction because of anything to do with the van the guys arrived in. The nature of the crimes are such that the van should have been dealt with as a priority and taken off the road. The occupiers of the house had no time sensitive aspect and should have been dealt with second. The masks the Gardai are wearing are to protect against acids of fire, they are specially designed. The courts are independent of government, this was a court order to remove someone from private property, what would happen if they occupied your spare bedroom at home if you had one, should be forced to rent it? I really don’t know there is any easy answer to homelessness. Total nonsense. Talking about people occupying spare rooms is just ridiculous. Nobody wants an “easy answer” they want something significant to be done. However, there are always people who are comfortable who will shrug their shoulders and say “what can you do?”. But – they could get the acid in and around they eyes. I believe the other masked men are bailiffs working for the courts, which is fine that’s there job. And what would make you believe that? Whilst I haven’t been following this particular protest too closely (I got the impression from previous occupations it’s a group of young adults doing their best to make a very valid point to the rest of us – and in a fairly passive way too compared to things I saw across the water well documented from Thatchers time – about one of many things this dysfunctional Govt. are up to) I am now VERY INTERESTED. I want to know more about them, what they are trying to achieve, who owns these zombie properties & who is gaining from it. So they got my attention & I imagine many other voters attention too. So I think definitely its a big fat OG. This particular event is hugely suspicious to me. I’m very certain that if in some scenario I was the owner of a house that got squatted for protest or otherwise & went to the Gardai & the courts I wouldn’t get their support in this manner for whatever balaclava clad reg plate free hit squad I chose to employ to enforce the eviction order. Someone of note who owns or benefits from zombie property called this. Patricia Ni Greil/Patricia McGreal. I know of a property developer with the same surname. A sure they’re just following orders. I don’t have an issue with the people having a peaceful protest about a stunningly broad ranging political issue. It is not their property. I don’t think anyone would dispute that. Why was this done within days of a new Garda commissioner being appointed? coincidence. The protest was last month, the court case last week. it takes time to organise the eviction. The Irish state and heads of Police have become tone deaf and sinister in their approach. No need for balaklavas outside of a terrorist / criminal gang situation. Its so heavy handed, more like an effort to intimidate any other people considering taking action over the housing crisis fiasco. Police around the world often wear balaclavas when when carrying out certain functions in order to protect their identities – especially important for a job like this where there is likely to be lots of people recording them. Shock Horror!! Gardai do their job!! Shock Horror!! Gardai look like the IRA! Or don’t. Was the van impounded and the occupants arrested for flouting road traffic laws here? I don’t understand why people are angry at the Gardai here. Those individuals were in breach of a Court Order to vacate the property by a certain time which had come and gone. As a civil society we can’t pick and choose which laws we wish to abide by and which we do not. Even if you disagree with the Courts order you still must abide by it or else we creep towards a chaotic system. Maybe some of these people are anarchist and that’s what they want but the vast majority of society does not want that. As for covering their faces, there is plenty of evidence that people have called to the private homes of receivers and people involved in that area. Just look at the Facebook pages that post pictures of people so that they may be identified whilst these people are doing their legal job. At the end of the day you may not agree with repossession or any of this but we must at the very least comply with the law. the point is not that the eviction was illegal in any way, it’s just pretty obvious that the gardai had a brief to ruffle a few feathers among the protesters. if this was a normal eviction you wouldn’t see this level of agression, it’s only the fact that these occupations have a political component that gardai want to nip it in the bud, given that TBTC have declared an intent to occupy more properties. but here’s the thing @trueblueterry – that argument is a practical nonsense assuming you accept that a concept of society is valid in the first place, no? sure if citizens had displayed perfect compliance throughout the annals of time then NOTHING would have ever have changed for the better i.e. no revolutions etc. sometimes civil disobedience IS obviously required to draw attention to an unfairness or fault and to break a logjam in how a particular civic society works & disable the somebody who is gaining unfair advantage from it. its called fighting back. Was no one talking about the homeless situation before this incident? 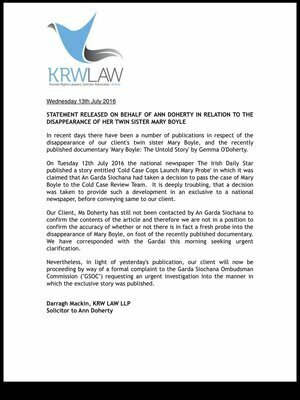 I believe the media was jumping all over the children sleeping in Tallagh Garda station story only recently. I believe you would have to be living underground to not know about the homeless situation in Ireland and therefore I do not think you can use the civil disobedience argument for what these protesters had been taking part in. Ultimately you and I elect the representatives sitting in the Dail, if you wish to make a change run for government instead of breaking the law. wow david, given your love of all things israeli, i thought this style of eviction would have given you a semi. Still cant tell which side you support. If the property was being used as a residence and the tenants were evicted illegally that is one completely seperate issue that needs to be dealt with on it’s own. As far as I’m aware, from the point of view of the courts, the protesters were illegally occupying a private vacant premises therefore the owner has been given the support of the guards while the hired hands carry out the forced removal of those inside. The issue of illegal eviction and the core root problems within the system are not being discussed here. Your getting lost in a fog amidst an unfortunate and ugly looking sideshow. The goons were acting on behalf of a private owner of the property backed by a court order so legally it doesn’t matter where they came from or what they are wearing. The one thing maybe suprising to many that this highlights is that you don’t actually have any rights. Ask yourself where they come from and who or what protects them? The short answer is because they can be trampled over or taken away at a moment’s notice depending on who is in charge and how they apply the power and interpretation of the legal system which can also be manipulated or changed too. The guards are a blunt force instrument of the state and a tool used by the elected establishment to remind you that anything can be done to you and your rights if necessary. Blaming the guards or the hired help is like blaming the hammer that you accidentally hit yourself over the head with, while nailing your colours to the mast. The root problem is policy and law, politics and legal. Democracy means constantly demanding all the elements of the system answer to the public’s best interest and are held accountable not that is somehow should keep itself in check.. The government as a group of individuals like any institution will never hold itself fully accountable where possible. It is up to active citizens, active in engaging with the system and willing to take action to hold power to account for it’s actions and to seek and maintain the highest possible standards. It helps to have independant oversight and various checks and balances but without active citizens politically engaged in all corners of the system there will always be repeated, cyclical abuse, corruption and injustice. It may only be possible to keep negative elements to a minimum but then the question is how much is acceptable? How much are you willing to tolerate without taking some responsibility on yourself to help fix the problems? I understand, respect and support the protesters because however technically or legally misguided they might be they are taking action as responsible citizens on behalf of the public best interest. Most definitely something to admire and for them to be proud of whatever the result, loss or success.